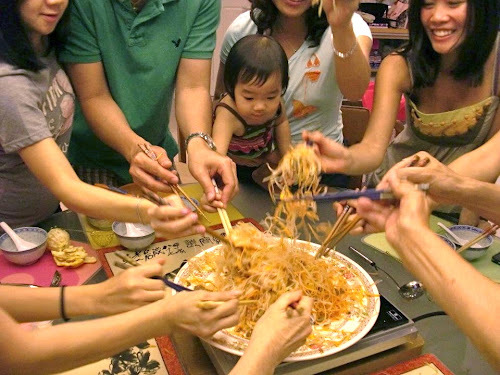 too lazy to cook: Chinese New Year in Singapore! 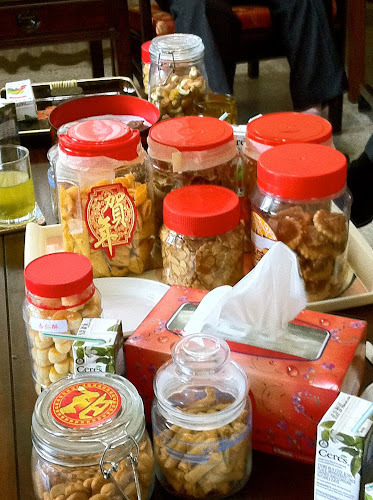 Chinese New Year in Singapore! Chwee kueh is a steamed rice cake that comes topped with savoury radish. I love this and unfortunately did not get to eat the famous ones at Tiong Bahru hawker centre this year. 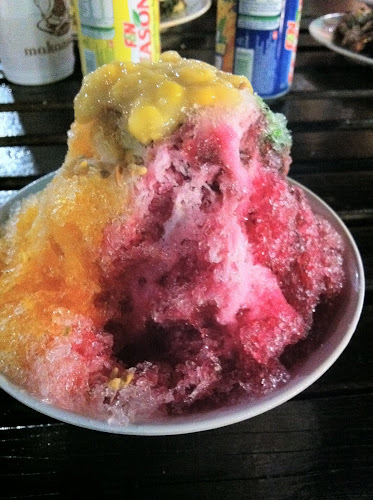 However, the ones we picked up at the hawker centre around our house did the job. VERY decadent for breakfast. This used to be one of my hawker favourites but I actually felt a bit sick after eating this - perhaps it isn't so great first thing in the morning... Chai tow kway (called carrot cake despite the lack of carrots) is basically a dish of little cubes of radish stir fried with egg and doused in sweet soy sauce. I used to love the "dark" variety but realised that my stomach just can't handle it anymore. Okay, it doesn't look that much healthier especially with all the chilli sauce added to it, but somehow it sat better in my stomach. Mmm. I can't come to Singapore without eating chicken rice!! We ordered half a roast chicken and half a white chicken and happily demolished both. The white chicken was amazing - super tender, full of flavour, and just the tiniest bit oily which is how I like it! I quickly picked out all the boneless chicken at the bottom of the plate to hoard in my bowl hehe - I know, bad etiquette. I'm not a huge fan of the roast chicken, which is roasted on a slow fire, but it was still delicious. The soup was also really fragrant but unfortunately, the rice was just passable. 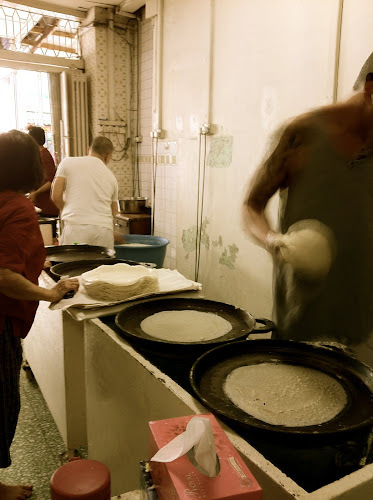 We always eat popiah on the second day of Chinese New Year (my dad's side is Fujian) so we trekked out to buy our freshly handmade popiah skin out at Kway Guan Huat Joo Chiat where we've been going since I can remember. We ended up buying a whopping 1.5kg of the stuff which was definitely way more than we could finish haha. It looks like little mimi is having a huge feast for herself! The filling consists of pork, shredded carrot, lettuce, turnip, and beans and the accompanying ingredients I love are the egg, seaweed, peanuts and garlic :) Not to mention a heavy dosage of the sweet sauce! 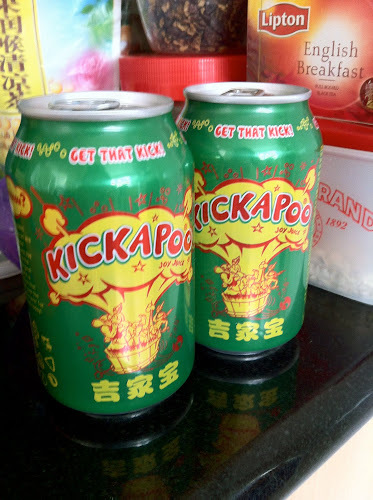 Can't have popiah without my beloved childhood drink of Kickapoo Joy Juice. To be honest, taste wise is just meh but I always drink it for the nostalgia factor and the awesome name! Makes me happy just looking at the can. Had a lovely lunch at Food For Thought - a slightly healthier less oily start to the day after all the CNY binging. Food For Thought is a small and cozy cafe that donates part of their profits to various charities. It's located at Singapore Art Museum in this charming little housefront that apparently used to be a school. I loved the big, airy feel to the restaurant with the high ceilings and natural lighting. I always wish more places in Hong Kong did a simple sandwich with pesto chicken but I hardly find pesto anywhere on the menus here! This was fresh and delicious - just what I needed to get my body feeling slightly less lethargic from all the grease. The sandwich also had grilled eggplant!! I love how eggplant just soaks up all the yummy sauces. Root beer floats made properly with A&W! I'm usually not a huge fan of root beer floats but this one was really yummy with loads of ice cream. 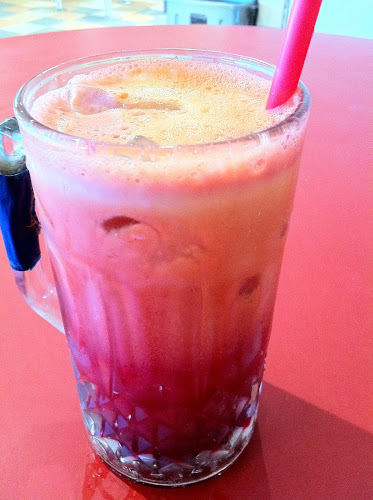 I went to ABC brickworks hawker centre and got this delicious juice comprised of apple, beetroot and carrot. I couldn't really taste the beetroot but there was definitely a lot of carrot which I love. Washes down the hawker food pretty well, and it made me feel super healthy! Should make it at home. So much sauce hehehe. Tender juicy meat with heavenly gravy makes for a delicious meal. Not to mention the soup in the background - had quite a spicy kick to it. I love Singapore's dried wonton cha siu mee. I don't know why but it always tastes so much better to me than any you get in Hong Kong which is a bit odd considering it's a Cantonese dish :P The wontons are also bite-size which I prefer to the whopping big ones you sometimes get in cha chaan tengs here. I tried out a Korean restaurant with some friends which came highly recommended by a number of Singaporean food bloggers (I think the restaurant was called Your Woul?) Unfortunately, the meat was really subpar - they prepared it for us and ended up overcooking all the meat. I could hardly chew through the beef. It was also a really small portion given the price. Luckily, the cooked food we ordered fared better and they served pretty decent banchan. Unfortunately, this year we went the healthy route and bought a yu sheng that did not come with fried crackers and had much less oil and plum sauce... hence the very bland taste :( Ended up just picking at the raw salmon. Nevertheless, still fun to toss to prosperity :) Even baby had fun looking so determined! Usually when we're back in Singapore we'll try to get in a hokkien meal with the grandparents and whenever we manage to book a seat, the only thing I wait for is the kong ba bao!! I love this stewed pork belly which is sooo tender and melts in your mouth as the oil dribbles down your soft fluffy bun hehe. Delicious! Too bad I only managed to get one bun as they were gone within seconds.